Call it a Masquerade. Call it Cosplay. Call it a Costume Contest. Whatever you want to call it, we have it! 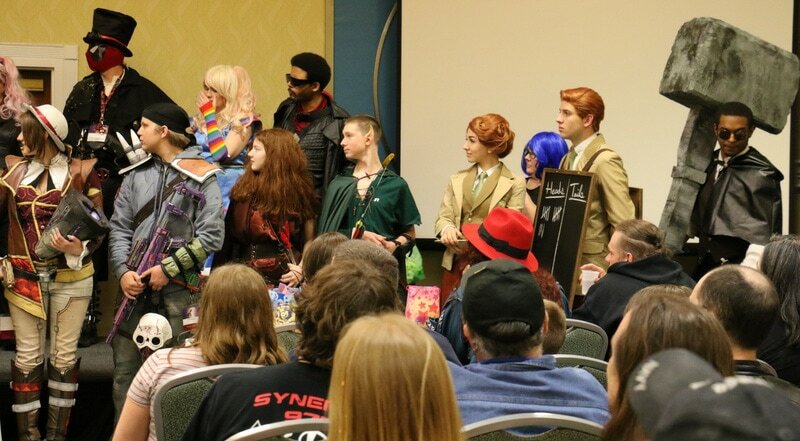 In the grand tradition of convention costuming, dating back nearly eight decades in SF fandom, RavenCon is proud to feature an annual Masquerade, a grand parade of people putting on their best cosplay and entering into a contest! The RavenCon Masquerade is held on Saturday night and draws some of the best costumers around. And for those that don’t feel like competing? Just walk around the convention in costume. We LOVE our hall costumers. I guarantee that you’ll be noticed and you might even be given a prize just for wearing a costume! If you’re interested in participating in the Costume Contest, there are a few rules. Be sure to get your application in early. Please note that in order to enter, you must be registered at the convention. You must either be an attendee with a weekend pass, or you can purchase a day badge the morning of the convention. The contest is open to all ages and there will be prizes! Before entering, you should read the complete rules and fill out an application form. Posted on March 12, 2012 by ravenchair.